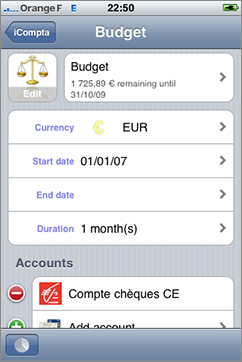 The accounts list displays the accounts of the document with their icon and their balance. 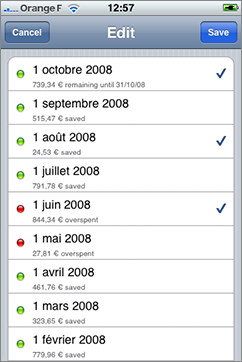 The budgets list displays the budgets of the document with their icon and their remaining amount. 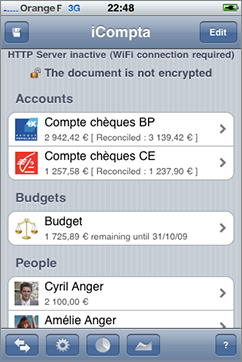 The people list displays the people of the document with their icon, their money and their overall situation with other people. When you are not in editing mode, you can touch an account or a person to show its transactions and you can touch a budget to display its reports. When you are in editing mode, you can touch an account, a person or a budget to edit it. You can also add, remove and reorder items by activating the editing mode. 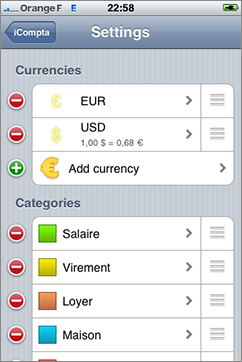 Currencies and categories : shows the currencies and categories screen. Transfer : shows the transfer screen. Statistics : shows the statistics screen. Balance evolution : shows the balance evolution screen.
? : shows the user guide. You can edit the name, the icon, the currency, the original balance and add some information about your bank account for online banking. Factory settings : displays a list of financial institutions which may contain yours in order to fill some settings automatically (icon, online banking address and OFX direct download information for supported financial institutions). You can edit the name, the icon and the currency. Address Book : allows to import the name and icon from a contact. 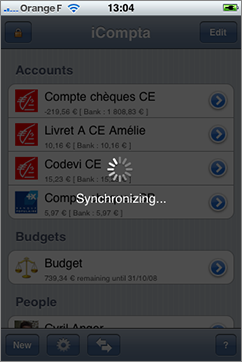 + : shows the new transaction screen. 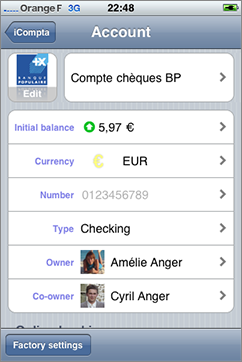 Batch change : allows to perform a change on all displayed transactions. Preferences : allows to change the sort key and to hide reconciled transactions. Download transactions : attempts an OFX direct download. 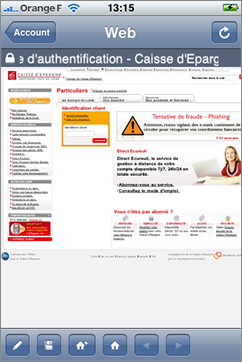 Online banking : shows the web site of your bank. Situations : shows the situations screen. The new transaction screen allows you to create a new transaction. Please refer to the following section for an explanation on the different fields. When you fill the name of the new transaction, iCompta searches the last transaction having the same name and let you copy its values to avoid entering them again. You can do that by touching the blue button located on the right of the matching transaction. 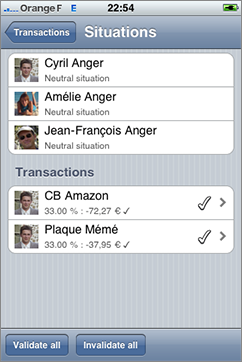 The situations screen displays the situation of the current person with the other persons as well as each transaction the current person participated in. 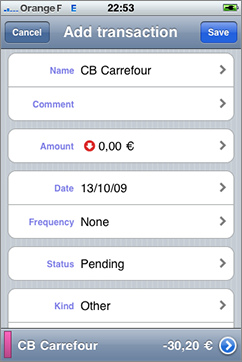 The description line displays the description of the transaction. The date line displays the date when the transaction occurred. The frequency line allows you to make a repeating transaction. You can either create the next occurrence manually or wait for it to be created automatically by iComptaMobile. When the new occurrence is created, the frequency of the previous transaction is restored to none and as there is no link between the 2 transactions, modifying one won't affect the other. The ending date line displays the date when the repeating transaction ends. The amount line displays the amount of the transaction. You can touch the left arrow to switch between credit and debit where you are in the edit screen. The kind line lets you choose the kind of transaction. The info line lets you specify the number of the check or the credit card used for the transaction. 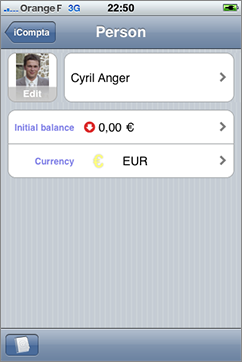 The status line displays the status of the transaction. 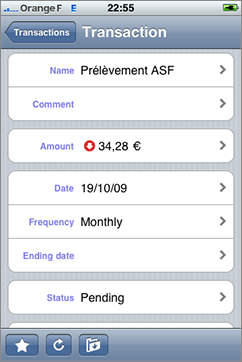 Canceled transactions are not considered when computing account balance and statistics and can be useful if you want to remember that you made a cancelled check as security for example. The reconciled date line displays the date when the transaction was effectively credited or debited on your account. The comment line displays an optional comment about the transaction. The categories section allows you to tag the transaction with one or more categories. The participants section displays the people other than you involved in the transaction. Highlight / unhighlight : you can highlight or unhighlight current transaction. Duplicate : you can duplicate the current transaction. Move : you can move the current transaction into a different account. 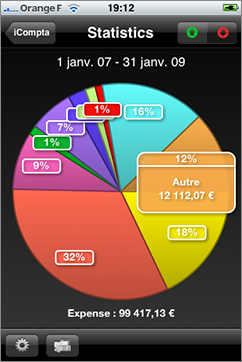 Budget breakdown : shows the budget breakdown screen. 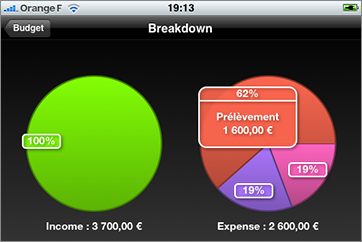 The budget breakdown screen will display the part of each category in the budget incomes or expenses as a pie diagram. You can click on a percentage to display more information. You can display the list of reports by pushing the settings button in the toolbar. You can then select one or more dates to see whether or not you fit in your budget. 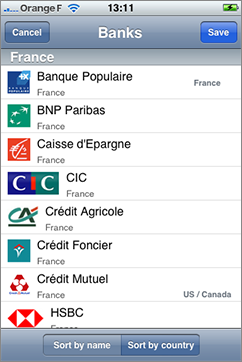 The currencies list displays the currencies of the document with their icon and their change rate. The categories list displays the categories of the document with their icon. 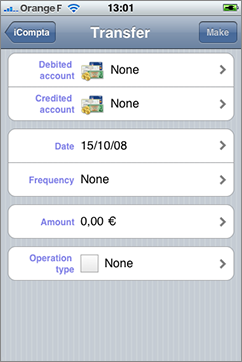 This screen allows to create automatically two transfer transactions in the selected accounts with the desired amount, category and frequency. 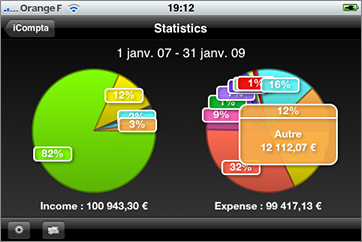 The statistics screen displays the part of each category in your global incomes or expenses as a pie diagram. 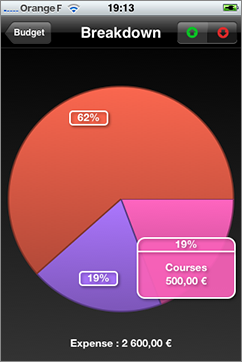 You can click on a percentage to display more information. You can push the preferences button to change the statistics period and choose to include transfers or not. You can push the accounts button to change the selected accounts. 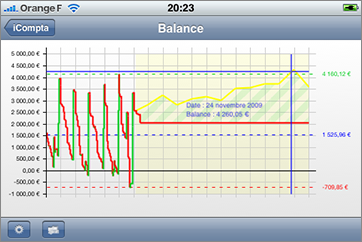 The graph shows monthly evolution of the balance of selected accounts in the selected date range. 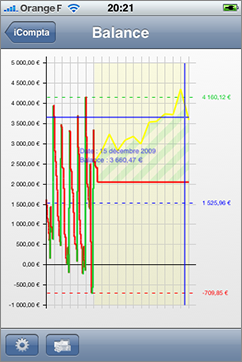 By default, the next occurrences of periodic transactions are not included in the graph but you can choose to include them by activating the switch in the settings. When you touch the graph, a blue target is drawn to indicate the date and the balance corresponding to your finger position. You can push the settings button to change the balance evolution period and modify the options described above. Synchronization with iCompta 3.0+ on Mac. Please refer to the synchronization section of the Mac version user guide. 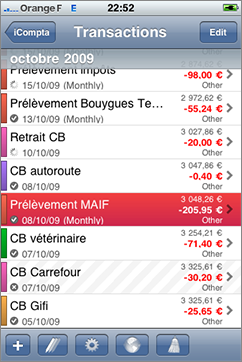 OFX direct download : only with supported financial institutions. Embedded server : you download files from your bank or export them from another software on your computer and then you send them to iCompta via a wireless connection. 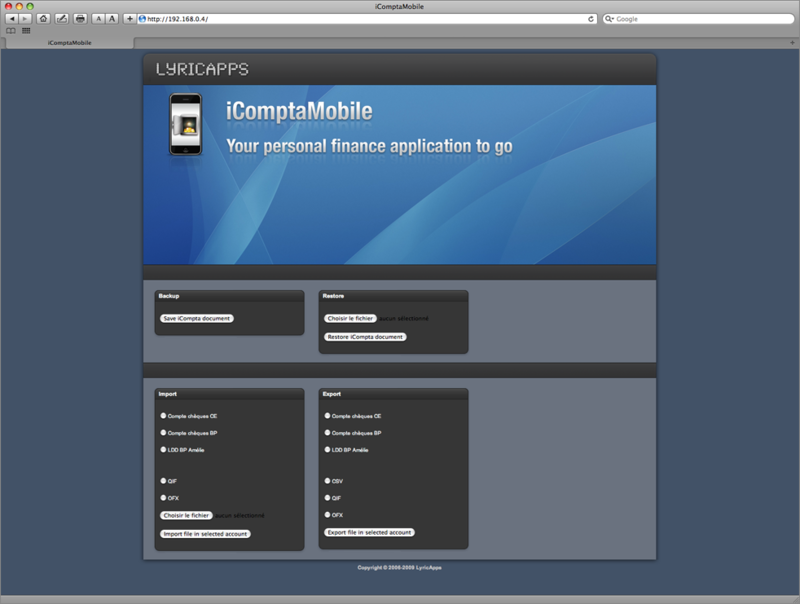 Embedded browser : you download files on your bank's web site directly in iCompta. You can touch the download button of the transactions screen to start downloading your transactions. If your bank doesn't support OFX direct download, you can import your transactions with the embedded web server or download them with the embedded web browser by connecting to your bank's web site. You can connect to the embedded server by entering the address shown at the top of the main screen in your computer's web browser (make sure your computer in on the same wireless network as your iPhone / iPod / iPad). With this server, you will be able to backup / restore all your accounts and also import / export transactions. If you choose to import a file a new window with import settings will appear. If you choose to export a file a new window with export settings will appear. 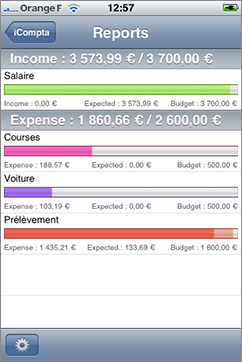 The gray bar gives you information on the current page and the toolbar allows you to control the embedded browser. 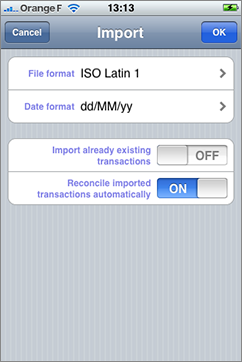 If you download a file which can be imported by iCompta, a new window will appear asking you if you want to import transactions contained in the file in the current account. 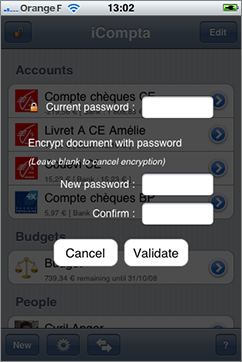 iComptaMobile can encrypt your documents with a password. Simply push the lock icon at the top left corner of the window and enter your password in the field. 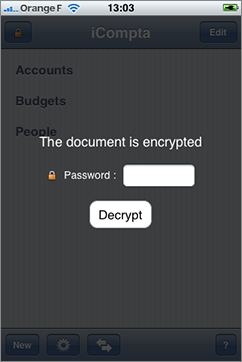 When you open an encrypted document, iComptaMobile will ask your password to decrypt it. If you want to save it unencrypted, push the lock icon at the top left corner of the window and leave the new passwords fields empty before clicking on the validate button. 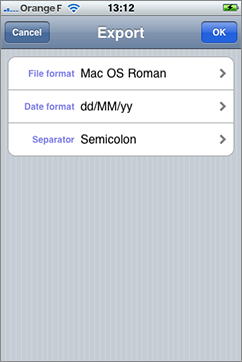 You can access iComptaMobile preferences through Settings application. 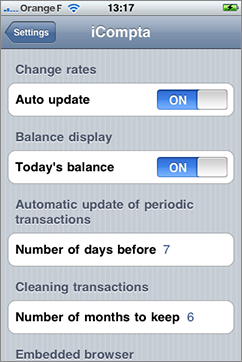 You can choose the number of months to keep when cleaning transactions. You can choose the user agent of the embedded browser.